I remember visiting multiple stores with my mom and grandma as they searched for the perfect reading chair. This was to be my mom’s alone, an investment, something that helped her unwind after a long day of everything that came along with being a single mom with two kids and three pets. At night, she’d sit in the chair in the living room, the room with no TV, and read a book while I played computer solitaire, listening to Green Day on my walkman. As was routine, she’d fall asleep that way, the chair a comfortable lullaby. Catching my mom dozing in her chair is one of my favorite memories of her. After she died and I was squeezed onto my father’s sunporch for a year or two, most of my stuff went into storage. I spent my first year of high school feeling like a vagrant—lacking roots, lacking things. But I kept the chair on the connected enclosed porch and fell asleep in it during that first summer without her. I’d wander to the outside deck to look up into the black night and let myself feel lost, and then return to her chair to fold inward before sleep. 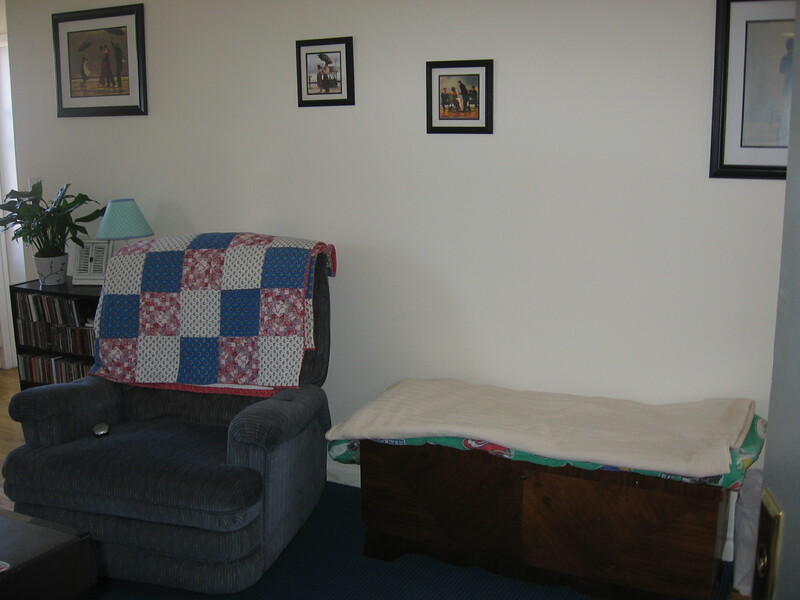 Soon after, my dad gave the chair to his mother—he was afraid of clutter, especially mine, especially hers. I spent high school and college plotting to get it back, imagining the places I would live and sit in the chair, using all of my resentment as motivation. After NYU graduation, I moved to Boston, thinking (wrongly) that I would be there a while, and I was finally able to reclaim the chair and drag it with me. From Boston to Brooklyn, from one apartment to another to another, the chair has been everything I wanted it to be—a reminder of my mom, a literal comfort, a way to transport. Sitting in it is probably similar to tourists putting their hands inside the handprints of stars: she was here, she was alive, I am here, I am alive. Tomorrow, I leave the chair behind. With puppy-made holes and a creaking wooden frame, I know that it’s time to let it go. Things, after all, are just things, but god, it was a comfortable chair.